Hamper: Square Linen Hamper with Tilt Lid; dimensions: 18-1/2" W x 19-1/2" D x 37" H.....Open construction designed for easy unloading and minimal lifting.....Gray epoxy-epoxy coated steel lid designed with prop to stay open when needed. 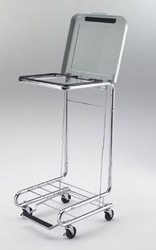 Linen Hamper; Dimensions: 35" H x 18"
Infusion Pump Stand, Five-Leg, Stainless Steel, 4-Hook Top 16"
Lift Assist I.V. Poles, 28-Hook Top Height adjustable from 56" - 96"
Infusion Pump Stand, Five-Leg, Stainless Steel, 2-Hook Top 22"
Mayo Stand: 12-5/8" x 19-1/8"